Crochet and knitting is so amazing because it’s truly an art. 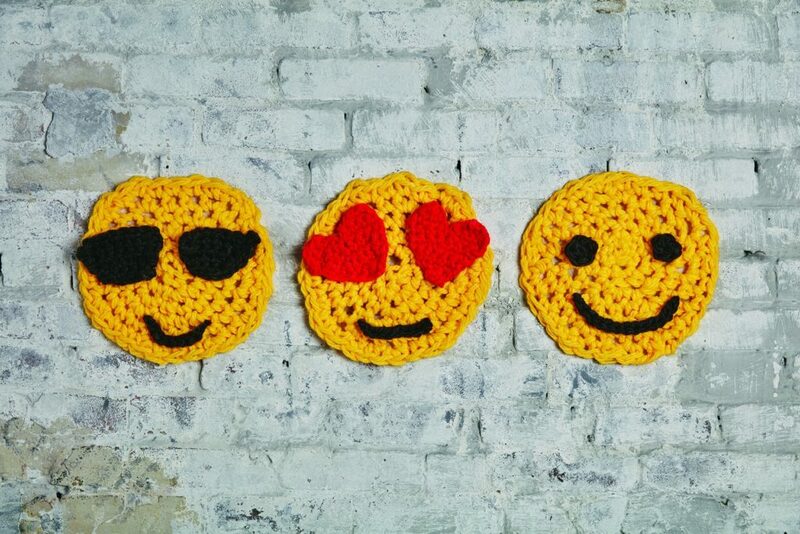 The variety and styles are endless, and London Kaye takes crochet to to the streets where her art can be admired by everyone! And now her Theme Packs are currently available at JoAnn Fabric stores (You can see them here). If you have a teen, tween, or young one in your life, I think they are going to flip over her super cool projects. I also see one that I’m planning to make this summer as the colors are so cheerful and vibrant! London uses simple stitches, which as you know is what I like best. 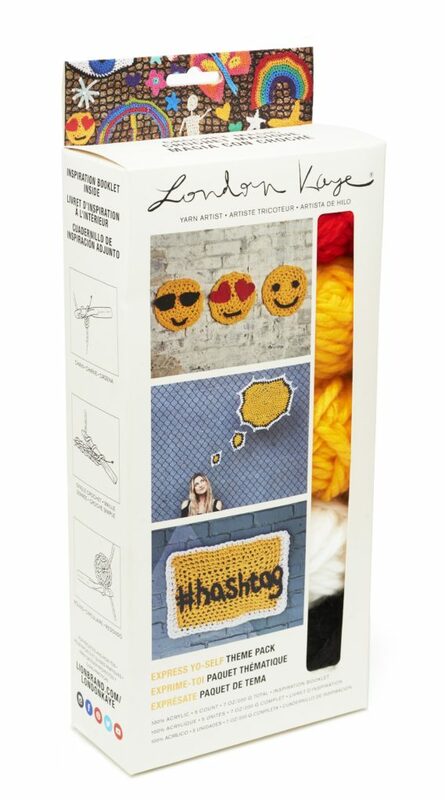 In one description of her theme pack it says, “London uses only 3 stitches in her designs–a chain stitch, a slip stitch and a single crochet stitch. Remember that London’s style is big, loose stitches!” Well, that sounds perfect to me! Scroll down to enter to win a theme pack of your choice as well as a pack of London Kaye Crochet Hooks!! The London Kaye projects are easy and fun, and personally I think they could be a great way to get kids and teens excited about our craft. You can see some of the theme packs below! I know my daughter will be all over this emoji pack! “Crocheting outside the lines” is a re-imagination of how to use yarn, as London’s technique utilizes a simple crochet stitch and a ball of yarn to transform everyday environments into visual wonderlands. London’s designs are easy to make and can be attached to anything: bags, sneakers, and yes, trees! So are you ready for an awesome giveaway? There will be two winners and you will receive a pack of your choice as well as a London Kaye Crochet Hook Set! If you aren’t the lucky one this time, remember you can find the kits at JoAnn Fabrics HERE! Email entry is mandatory, and you can gain entries by visiting my Facebook page, Instagram Page and/or leaving a here on the blog! Comments and likes are encouraged but not required over on Facebook and Instagram. To be eligible, you must be 18 years of age or older, with a valid, USA or Canada shipping address. False, fraudulent, or deceptive entries or acts will render entrant(s) and entries ineligible. ENTER BELOW FOR YOUR CHANCE TO WIN A THEME PACK OF CHOICE AS WELL AS A PACK OF 3 CROCHET HOOKS FROM LION BRAND YARN! TWO WINNERS WILL BE CHOSEN! 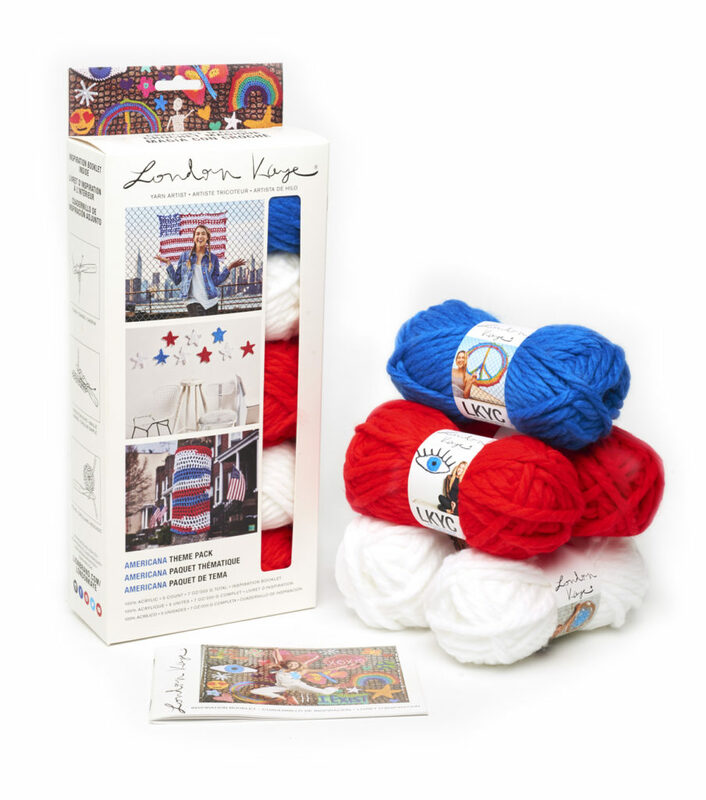 Thank you to Lion Brand Yarn for sponsoring this giveaway! Cute! I enjoy quick makes to break up the monotony of say long sleeves in single crochet. 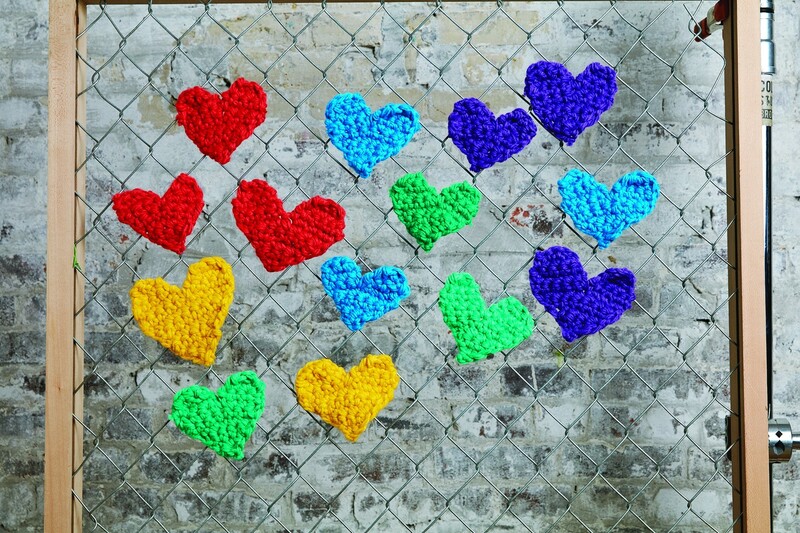 I love crocheting and knitting with colours that inspire me or just make me plain feel happy! Thank you for this opportunity! Always look forward to your emails with new patterns and ideas. Thank you. I purchased the 5? Color large heart. I wasn’t super loose and my heart wasn’t as nice but I enjoyed the kit very much. I wouldn’t mind winning a kit. I love the creativity and simplicity of these cute kits. Thank you for the opportunity. Mama in a stitch you do great work. Thanks for the giveaway opportunity! I love these fun kits as my young daughters are starting to learn to crochet and these are perfect for them! I love to crochet with grays, blues, and also “vintage” colors. These are really cute, and who doesn’t always need washcloths? My favorite colors to use are Rainbow colors. And gray. . I love anything and everything green and crochet a lot with green yarns. My little one would love the emoji kit! I love royal blue, gray and cranberry together. I also love cream, teal and gray. Thanks so much for this giveaway. My favorite color is any bright ones. I do have a tendency to lean towards the blues. My favorite color is purple and oh yeah blue lol. I love using all shades of green. These kits look like so much fun!! I love vibrant colors…blues, teals, pinks, purples. I love autumn colors and use them a lot to decorate my house. I love muted classic colors to crochet with! I love crocheting with Earth colors (greens, browns, orange, etc.) Because I am an earthy person- gardening, worm composting, recycling, food preservation! I love bright jewel tones, especially shades of ruby! I love the deep jewel tones. They are my go to colors, crimson, purple, navy, colors so intense that you almost taste them. But lately I’ve been drawn to some yellows, butter and goldenrod. Coincidentally those make good trim colors for jewel tones. Thank you for sharing your pattern and the stitch is new to me. Great job and for the give away. I love working with all purple shades, Teals and beachy colors, I love spring time pastels and autumn vibrant colors, whites and blues of winter shades. Hard to pick 2 colors! The only color I don’t care to work with is black because my eyes can’t figure it out! I love colours that are rich and deliciously vibrant along with neutrals. The colors are beautiful. I love bright colors. I love the colors in this kit, however, I do tend to use more grays and beiges in my projects. Thank you for the giveaway! I love bright colors but often use grays when knitting wearable items because it goes with everything! My 8 year old asked me to teach her to crochet this summer and these kits will be perfect!!! I love the beachy colors. But my favorite is purple. Thanks for all your pattrens. I love chunky yarn and I love quick projects! I will be trying the washcloth pattern. I love making washcloths for my own use and also for gift giving. These kits look like they would be a lot of fun to make. I have been crocheting since I was young and love doing it! I love all kinds of colors but find my eyes are attracted to yarn with pops of pink and bright shades more than neutrals. I like the kits and think my grandchildren who are in the process of learning to knit and crochet would be excited about the kits and the colors. JoAnn Fabric is one of my favorite stores. Thank you for your generousity with tutorial and patterns. I like working with all colors! I like purples or pastels. I have been using lots of grays lately and looking forward to using brighter colors in new projects. London Kaye is the bomb ;D Colours – well usually depends on mood & project. For the home I like soft and mellow – greens, blues, purples, yellows/golds, greys. They provide a nice backdrop for the jewels I like to crochet in. If vibrant, then I go for ROYGB(I)V rainbow colors! Thank you for another fantastic give-away! Who doesn’t love free yarn ! My favorite colors are found in the tones of autumn…reds, golds, & greens. My favorite things to crochet are garments and accessories, so I choose neutral, wearable colors such as tans and grays–but my absolute favorites are cool jewel tones…purple (ok, maybe not so cool), aqua, sapphire. I sometimes make a bright, wonderful scarf or hat from these colors for the sheer joy of looking at them. I love using lots of colors when stitching. My favorites though are purple, green and turquoise. I love so many colors. I usually like to choose neutrals or softer tones to knit with. After a few sessions of trying to teach our daughter to crochet a simple headband (good!) that she found with a variety of stitches (not so great), London’s kits sound like a great way to get into the craft for a tween! I love bright colors especially working with yellows. It’s so uplifting during the winter months. I love vibrant colors and use those colors to make washcloths, to go along with my handmade soaps. I love all the colorful ideas. Thank you for posting such awesome tutorials. I have learned to so much from you! Thank you for the chance to win! I have a niece that I’ve been trying to teach to crochet. This would be the kind of thing I could inspire her with. These projects are so cool! And I love how affordable they are. I’m thinks by I need the Americana kit in time for Summer! I am so excited about this giveaway!! I love trying new yarns. I crochet every day, and those days I dont, I feel as if I missed somethin. This time of the year, I love very bright colors. I always go to blues and purples or the really bright colors. I love crocheting with variegated yarn. Love the color changes as I create! Prefect fun summer colors. Thank you for the chance to win! I love these kits! I may now be able to get my daughter to learn to crochet with these! Thank you Jessica! I don’t actually know how to crochet, knitting is my thing! But, I want to learn and a free kit would be great motivation :-)! I always look forward to your emails. you have motivated me through a lot of crocheting this winter! Hi Jessica! I like to crochet with mostly muted colors, grays, blues, browns and white. I do like vibrant colors in some projects. I love crocheting with bright, vibrant colors! Blue is my favorite color but I like to crochet with all the colors. It depends on what the project is and who it is for. How fun these look. Thanks for sharing. I think I might have to put them in my daughters dorm room if I win! Such cute patterns and bright colors! Thank you! Great stuff! Cool giveaway. Thanks for the opportunity! Love the bright colors. Great accents for a lot of things. Those designs are super cute! I love the bright colours and I’m all over the emoji one too. I love anything bright, blue and pink. Recently Ii discovered that I love the dark gold color too! I love crocheting with bright oranges and yellow-oranges. I love to crochet with greens and with blues! I love to knit in shades of teal! Fun stuff and I really want to try out those hooks! I love to crochet with weird colors that you wouldn’t think to out together! I also love your stuff! I don’t really have favourite colours to crochet with, but I sure love my wall of rainbow yarn!! Love your generous free patterns that are easy to follow. Thankyou!! Rainbow colors are my favorite. I quite simply love all colors to work with…..the more vibrant the better. Love your designs! Love purple, purple, purple!!! I don’t really have a favorite color to knit or crochet with. I have a wide assortment of colors in my stash and just go with whatever I’m feeling at the moment. I love your patterns!! I knit & crochet so i get the best of both worlds!! I love your crochet patterns. My favorite colors can be found in Lion Brand’s Mandala Gnome: turquoise, greens, yellow, raspberry, and purples. Thanks! I usually like to work with jewel tone self striping colors or just random variegated. It also depends on the project. Lovely, I can’t wait to start! I love to crochet and knit with blues and purples. Love bright colors but my go to has been navy and grey. I love all shades of pink and blue! I love using bright colors! I love Mamainastitch’s designs and easy patterns! London Kaye’s designs are fun and different. I love to work with greens and purples, earth tones and florals. I dig colors derived from nature! I started to crochet before I started to knit and although knitting is now my fave, I still crochet quite often. Although I tend towards softer colors, I do enjoy the bright ones occasionally too. The Americana pack is lovely! I love the bright colors and so does my grand daughter. I enjoy the small quick projects to break up my big projects. I always have two different projects going at the same time. Thank you for the free patterns, I have made many of them. I like yellow and orange.